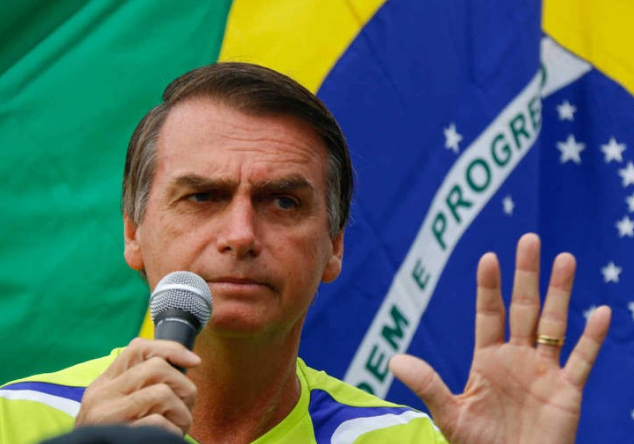 In his first major interview since being stabbed, the right-wing populist candidate for the Brazilian presidential elections, Mr Jair Bolsonaro, said he would not accept the outcome of next month's election if he loses. Speaking in his known straight-shooting style, the politician told a Brazilian TV broadcaster: "from what I see in the streets, I won't accept any result that is not my election." Related coverage: <a href="https://thegoldwater.com/news/38000-Brazil-Election-Pollsters-Expect-Bolsonaro-Versus-Haddad-After-First-Round"> Brazil Election - Pollsters Expect Bolsonaro Versus Haddad After First Round</a>. Mr Bolsonaro, a retired army captain, has led a very successful campaign in what has been Brazil's most polarizing election since the country's return to democracy in 1985. He had previously declared to not trust Brazil's top electoral court and accused the rival left-wing Workers' Party of resorting to fraud as its plan B in the upcoming vote. Polls suggest the second round runoff will be between the PT’s candidate, Mr Fernando Haddad, and himself. Furthermore, Mr Bolsonaro’s running mate, retired General Hamilton Mourao, claimed that Brazil's armed forces might launch a coup if the judiciary is not ridden of political corruption. However, the Bolsonaro campaign has thus far not provided any evidence of potential voter fraud. For most of the Brazilian people the period of the military regime was the one of greatest prosperity in the country. The military prevented communist terrorists from taking power. They killed many people through their terrorist acts, this they do not say. As Chaves did in Venezuela, financed by corruption, drug trafficking and money stolen from Brazil by communist Lula and by the Cuban influence of the São Paulo Forum. The 60,000 murders occurring in Brazil mean that the left plan is working, the goal is to disorganize the country to seize power, through force or rigged elections. Almost the entire Brazilian press is committed to the left and does not care about the risk that country is running, since they receive a lot of money from the government. The fakenews against Mr. Bolsonaro are often produced by the press itself. The only candidate in the elections that is not part of this scheme is Mr. Bolsonaro.